THE WAR WAGON combines two of my favorite genres into one rip-snorting package: The Western and The Caper Film. I absolutely love a good horse opera and many of my favorite movies are westerns that I can watch over and over again. And I love a good caper. I just enjoy the hell outta seeing a bunch of expert thieves steal something that everybody says can’t be stolen. Maybe it’s because most thieves are so inept in real life and never seem to be able to pull off their heists with the aplomb and style movie thieves do. THE WAR WAGON can be classified as the western version of an armored car heist. The title vehicle is an armored fortress on wheels that is protected by a Gatling gun and 32 heavily armed riders on horseback and the entire convoy gallops along at full speed from start to finish. Nobody has ever successfully been able to rob The War Wagon and its owner is about to transport the largest shipment of gold The War Wagon has ever carried: a half million dollars. Taw Jackson (John Wayne) has a carefully put together plan to rob The War Wagon and the way he sees it, he’s got a right to the gold. After all, it came off his land that was stolen from him by Frank Pierce (Bruce Cabot). Pierce had Taw framed for murder and sent to prison and in the years that Taw has been incarcerated, Pierce has been stripping Taw’s land of the gold. Taw assembles a motley crew to help him take The War Wagon: Lomax (Kirk Douglas), a gunslinger for hire who once almost killed Taw. Levi Walking Bear (Howard Keel), an Indian fully assimilated into the ways of the white man who talks a Kiowa tribe into the heist. Billy Hyatt (Robert Walker) is an uncontrollable drunk until it comes time for him to handle explosives and then he’s as calm and centered as Sunday morning. Wes Fletcher (Keenan Wynn) works for Pierce. His inside knowledge of The War Wagon’s schedule and Pierce’s organization is vital to the success of the heist. The plan gets complicated when Pierce contacts Lomax and offers him $12,000 dollars to kill Taw once and for all. Taw has also got to keep Billy Hyatt away from not only the firewater but Wes Fletcher’s extremely pretty young wife who shows just as much of a liking for Billy as he has for her. One thing you notice about THE WAR WAGON that is different from other roles John Wayne has played: usually in a movie like this, whenever the hero comes back looking for revenge for wrongs done to him, he can usually find a few townspeople willing to help him out. Not here. In fact, when Wayne’s character returns to town, it’s almost as if the townspeople act like Taw Jackson deserved what happened to him. Taw doesn’t have a friend to back him up and indeed, he spends a lot of this movie looking over his shoulder to make sure that Lomax doesn’t try to collect the sure $12,000 bucks as opposed to a share of the half million. If the movie has any major faults is that there’s no really memorable villain here. Bruce Cabot’s Pierce is a little more than a glorified bookkeeper with a mean streak. He’s always sneering at Wayne while hiding behind a wall of flunkies and hired guns. The movie’s all about the heisting of the gold and that’s it. But it’s an enjoyable heist with loads of action and with interesting supporting roles from some familiar faces. Look for Bruce Dern early in the movie and Gene Evans (who starred in Sam Fuller’s classic war film: “The Steel Helmet”) is in this one as well. 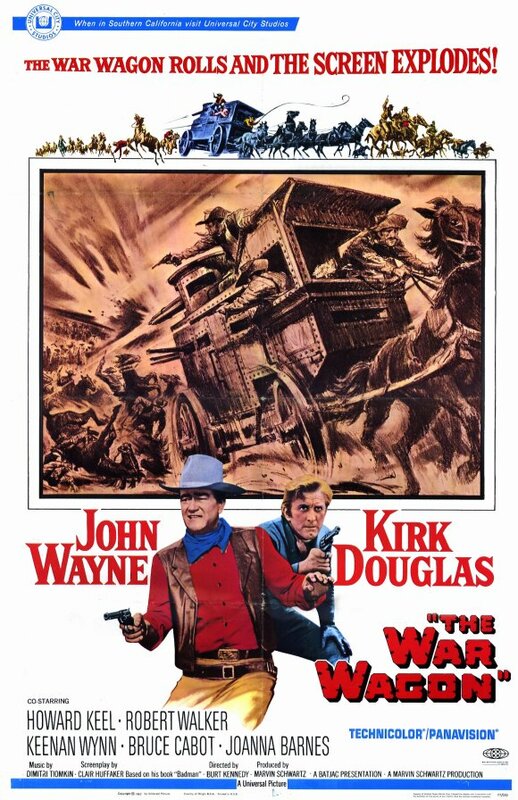 THE WAR WAGON isn’t on the level of other Wayne westerns such as “Rio Bravo” “El Dorado” “The Shootist” or “True Grit” bu it is good watching if you’re into westerns or caper films. But I’ll tell you what…just check out the opening credits and the absolutely kickass theme song with Ed Ames lustily belting out “The Ballad of The War Wagon” and then tell me you don’t wanna see the rest of the movie. Great review, Derrick, as always. 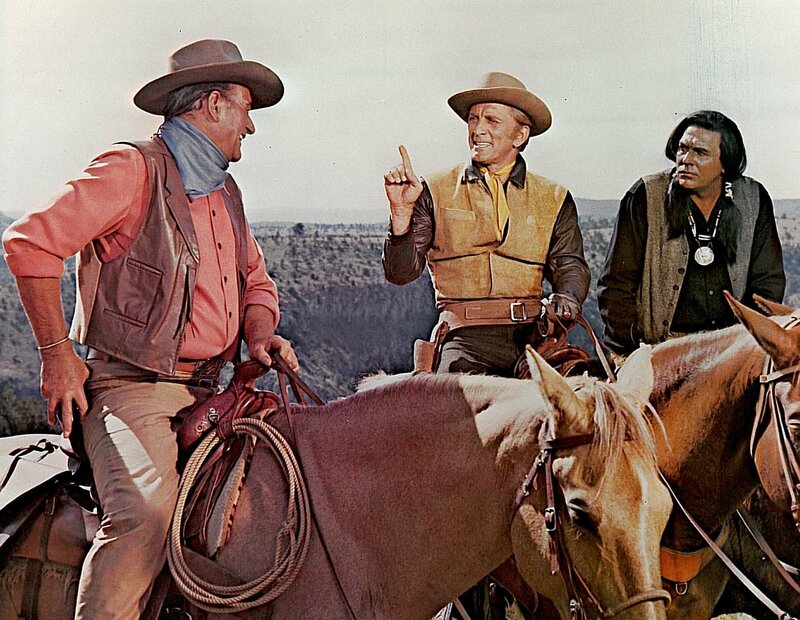 The Searchers is another movie I enjoy due, in part, to the Duke playing against type. A very good film I agree. I found whole surfing the channels a few weeks ago with about 20 mins to go. Agreed not as good as Wayne’s classics but never one to ignore.